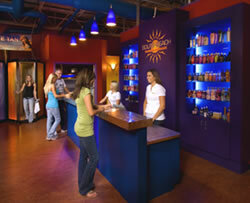 South Beach Tanning Company draws a parallel between the international image of South Beach and a customers experience at a South Beach Tanning Company salon. Inspired by the art deco look prevalent in South Beach Miami, the result is a unique chain of salons with a "South Beach Chic" appeal. Upon entering, you are immersed in a high energy, uniquely stylized, art deco interior that floods all your senses. Just as Miami's South Beach is identified with beautiful tans and setting the trends, South Beach Tanning Company offers its clients an experience that deliver exceptional results, a beautiful tan and an energized spirit. Whether it's our air-conditioned premium tanning beds with surround sound systems, our exclusive high-pressure tanning units, or our UV-Free VersaSpa, South Beach Tanning Company offers its clients only the best equipment available on the market today. Tanners want results; our equipment delivers, even for the most serious tanners! South Beach Tanning Company takes a custom approach to its selection of only the top, state of the art equipment available. 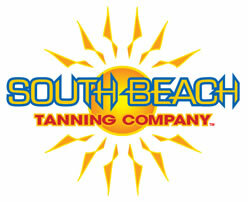 South Beach Tanning Company is not locked into any binding agreements with any one manufacturer. Every year our technicians evaluate all of the available equipment on the market and then make a decision as to which units from each category will position South Beach Tanning Company ahead of the competition. This results in a unique mix of equipment designed to be highly competitive and reaches a broader segment of the market. Further, this strategy leaves South Beach Tanning Company with the ability to adapt to advances and changes in the industry faster and more efficiently than its competition. Spectacular nightlife, fine dining, art deco design, trend setting influences, and beautiful beaches make South Beach, Miami, a one-of-a-kind destination. 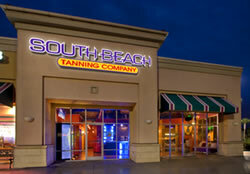 Like its internationally known namesake, South Beach Tanning Company's uniquely stylized award winning interiors, state-of-the-art equipment, streamlined operations, exceptional support, and a thriving market create a one-of-a-kind franchise opportunity. Today the indoor tanning industry is a $5 billion dollar industry, and every year about 28 million people, or 10 percent of the U.S. population will visit an indoor tanning facility*. As a South Beach Tanning Company owner, you stand to reap the benefits of being part of a significant and stable industry. You also stand to benefit from indoor tanning's widespread appeal - to men and women, singles and couples, adults and teens alike. We are offering qualified individuals a chance to help people feel good about themselves…the opportunity to own an award winning, exciting salon that will be second to none in your area…and to follow an uncomplicated, proven system with full franchisor support. The preliminary response to the news of our organization expanding through franchising has been overwhelming. This interest being generated, along with our steady annual growth, leads us to believe that South Beach Tanning Company will rise to the top of the tanning industry in rapid fashion. We like to tell our customers that if they can't make the trip to Miami, South Beach Tanning Company is the next best thing to being there. Clients seek a salon experience that mirrors their own self-image and lifestyle. The South Beach Tanning experience, one not found at other salons, is designed to reflect the "attention to details" our clients appreciate in their everyday life. Each client receives an expert assessment of their tanning goals - which range from building a base tan prior to an upcoming getaway, to adding some color prior to an upcoming special event, to deepening their already existing tans - and a recommended, customized tanning program designed specifically for them. Clients enjoy this unique experience which is further enhanced by the spaciousness of our locations, the convenience of extended hours, no appointments and no waiting. And the South Beach staff, trained to make every visit an incredible tanning experience that exceeds the clients expectations, compelling them to return for that beautiful tan, again and again. We believe everyone deserves a South Beach Experience! If you are excited about this opportunity and want to be a part of our growth, please fill out the form below. Note: This franchise is only currently being offered to residents of the following states: AL, FL, GA, NC, SC, and to individuals with at least $100,000 in liquid capital. 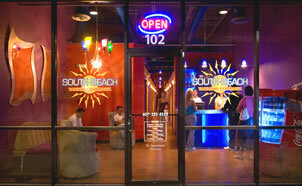 Click on Request Information for FREE info on how to open a South Beach Tanning Company franchise today! Please Note: This South Beach Tanning Company franchise opportunity and other franchise business opportunities, businesses and franchises for sale on this web site are not to be considered as an "offering", "franchise offering", suggestion or recommendation by Franchise Leader™. This advertisement depends entirely on the truthfulness of the information provided by our advertisers which includes, but is not limited to, franchisers, franchise brokers, franchise consultants and business brokers. Franchise Leader™ recommends that you consult a lawyer, financial consultant, accountant or professional advisor before buying a franchise or business opportunity or any type of business. By using this form or any part of our website, you have agreed to all terms and conditions of Franchise Leader™. Please review our Terms & Conditions for more information.